Everyone likes going to the zoo. It’s a chance to see exotic animals that you might not run into in your every day life. It’s also a chance to raise awareness for these special animals, especially those that are endangered. 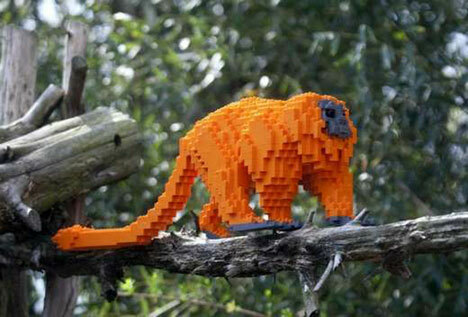 The Philadelphia Zoo has recently opened a special exhibit called ‘Creatures of Habitat: A Gazillion-Piece Animal Adventure.’ Instead of having real animals in their habitats, the zoo is featuring 10 habitats with animals made out of legos instead, including penguins, polar bears, and tamarins. All the lego work has been done by Sean Kenney, a certified lego professional. The zoo hopes that by presenting this kind of exhibit, it will give people more of a focus on just how fragile our environment is and bring awareness to the fact that we need to protect out Earth. If you can’t make it down to the zoo, you can take a peek at the exhibit over the internet. All you have to do is log onto to philadelphiazoo.org and complete a Personal Sustainability Plan, which will guide you through what you can do to protect our most precious wildlife. The exhibit will be featured until October 31 of 2010. To see more pictures of the exhibit, visit treehugger.com.